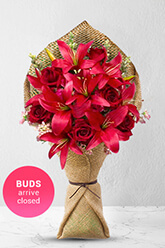 Not all Roses, not all Asiatic Lilies, this fantastic bouquet displays an attractive floral combination to really express your heartfelt admiration for the special person in your life.Lilies may be sent closed/partially closed in order to prevent damage and to last longer.Vase not included however to better personalise your gift, we recommend adding a Superior Vase to accompany this lovely bouquet. Flowers were ordered a week or so prior. They arrived on time and looked fabulous. Delivery was made on the date, at the time and location requested. It arrived in excellent condition. Beautiful flowers, delivered on time! Quick, easy and on time delivery. Thank you!